thatha: bhagavatha: svayam Eva AthmasanjIvanEna – thatha: – after that; bhagavatha: – by bhagavAn; svayam Eva – by himself; Athma sanjIvanEna – for AthmA’s superior sustenance. avalOkanEna avalOkya – avalOkanEna – through his eyes; avalOkya – having seen. bhagavAn with love in his eyes looks at the jIvAthmA and blesses him. samastha klESa apaham nirathiSaya sukhAvaham – samastha – all; klESam – troubles; apaham – removing; nirathiSaya – most wondrous; sukhAvaham – pleasant. bhagavAn‘s smile removes all the troubles of samsAram that the jIvAthmA had suffered earlier and creates a feeling of pleasantness in him. Sirasikrutham dhyAthvA – Sirasikrutham – keeping on the head; dhyAthvA – meditating. The jIvAthmA meditates that he is taking the two exalted feet of bhagavAn on his head. amrutha sAgar anthar nimagna – amrutha – nectar; sAgar – ocean; anthar – deep inside; nimagna – immersed. Taking the exalted feet of bhagavAn on his head makes the jIvAthmA feel that he has immersed himself deeply in the ocean of bhagavAn’s auspicious qualities, and without any fear of coming out, enjoys the experience. sarva avayava: sukham AsItha – sarva – all; avayava: – parts; sukham – happy; AsItha – lives for ever. The jIvAthmA lives with such happiness for ever in SrIvaikuNtam, doing all kainkaryam to bhagavAn. jIvAthmA realises that pArathanthriyam (dependence on bhagavAn) is his svarUpam (basic nature). In line with that, he carries out SaraNAgathi to bhagavAn as the path for attaining bhagavAn. Then he leaves the prAkrutha maNdalam (materialistic realm) and reaches aprAkrutha maNdalam (SrIvaikuNtam). 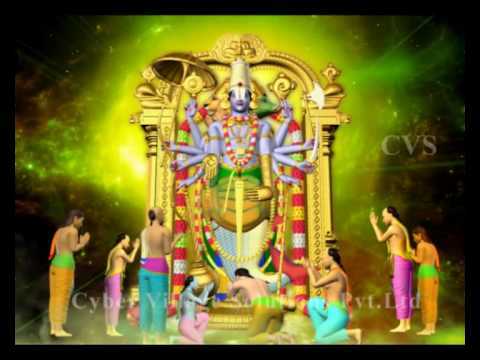 There he gets to have dharshan (audience) with bhagavAn who is worshipped constantly by the entire assemblage of nithyasUris (those who live permanently in SrIvaikuNtam, without any connection with materialistic realm, our samsAram). Then he prays for carrying out kainkaryam to bhagavAn and is granted kainkaryam. For ever after that, he stays happily in SrIvaikuNtam, never to return to samsAram. With this, we come to the end of SrIvaikuNta gadhyam (as a corollary, to the end of gadhya thrayam). This entry was posted in gadhya thrayam, Other, SrIvaikuNta gadhyam on April 26, 2016 by T N Krishnan. With the love born out of experiencing bhagavAn, the jIvAthmA, now feeling extremely happy, will always have dharSan (having bhagavAn as his focus) without interest in any other thing. anubhUyamAna bhAva viSEsha: – anubhUyamAna – being experienced; bhAva – state; viSEsha: – special. The jIvAthmA experiences bhgavAn’s auspicious qualities. nirathiSaya prIthyA – nirathiSaya – nothing more wondrous than this; prIthyA – with love. After experiencing the auspicious qualities of bhagavAn, he feels that there can be nothing more wondrous than this, and with overflowing love…. anyath kinchith karthum dhrashtum smarthum aSaktha: – anyath – anything else; kinchith – even a little bit; karthum – to do; dhrashtum – to see; smarthum – to think; aSaktha: – not capable. He is so overflowing with love after experiencing bhagavAn that he is incapable of doing or seeing or thinking, even a little bit, of anything other than bhagavAn. punarapi SEshabhAvamEva yAchamAna: – punarapi – again; SEshabhAvamEva – in the state of carrying out kainkaryam; yAchamAna: – requests and prays to bhagavAn. He has been granted kainkaryam by bhagavAn. Still, he is worried that this should last for ever and out of that worry, he prays repeatedly to bhagavAn that it should last for ever. bhagavanthamEva – of SrIvaikuNtanAthan (bhagavAn). avichchinna srOtha: rUpENa; avalOkanEna – avichchinna – without any interruption; srOtha – continuous flow (like a river); rUpENa – form; avalOkanEna – looking at. He looks at bhagavAn continuously, without any distraction. avalOkayan AsItha – avalOkayan – look at; Asitha – let him for ever. Let the jIvAthmA keep looking at bhagavAn continuously without any interruption. We shall now see the last chUrNai of this gadhyam in the next part. This entry was posted in gadhya thrayam, Other, SrIvaikuNta gadhyam on April 24, 2016 by T N Krishnan. In this final part of 3rd chUrNai, we shall see how the jIvAthmA approaches bhagavAn and submits himself unto him. kadhA – when. He starts getting tensed for carrying out kainkaryam. mama kula dhaivatham – he is the prime worshipable deity for my family (here the term family refers to the group of ASrithars i.e. srIvaishNavas). mama kula dhanam – he is the protector for my family. Just as money is viewed as offering protection, here bhagavAn is the greatest protector in times both good and bad for his ASrithars. mama mAtharam – He bears me and does good for me. mama pitharam – he is the cause for my existence as well as one who does what is correct for me. mama sarvam – he is everything to me. He is whatever that has not been stated. sAkshAth karavANi chakshushA? – when will I see him? It was only a few sentences back he had said that he has seen him (dhyAna yOgEna dhrushtvA – seen him through mind). Now he is longing to see him. Is there anything contradictory here? SrI rAmAnuja says that he wants to see him with his eyes (chakshushA) for ever (sadhA paSyanthi). kadhAham bhagavath pAdhAmbuja dvayam SirasA dhArayishyAmi? – kadhA – when; aham – I; bhagavath – bhagavAn‘s; pAdha – exalted feet; ambuja – lotus-like; dhvayam – two of them; SirasA – through my head; dhArayishyAmi – will bear him. When will I bear his exalted feet on my head, asks SrI rAmAnuja. kadhAham bhagavath pAdhAmbhujadhvaya paricharyA karaNa yOgya: (thadhEka bhOga:)thathpAdhau paricharishyAmi – kadhAham – when I; bhagavath pAdhAmbujadvaya – bhagavAn‘s two lotus-like exalted feet; paricharyA karaNa yOgya: – be eligible to carry out kainkaryam; thadhEka bhOga – only that enjoyment; thath pAdhau – those exalted feet; paricharishyAmi – will get to do kainkaryam? First he wanted to take bhagavAn’s exalted feet on his head. Now he wants to know when he will be able to carry out kainkaryam to them. kadhAham bhagavath pAdhambujadhvaya paricharyASayA nirastha samsthEthara bhOgASa: apagatha samastha sAmsArika svabhAva: thathpAdhAmbujadhvayam pravEkshyAmi – kadhAham – when I; bhagavath pAdhAmbujadhvaya – bhagavAn‘s two lotus like exalted feet; paricharya – kainkaryam; ASayA – desire; nirastha – reject; samastha – all; ithara – other; bhOgASa: – desire in enjoyment; apagatha – gone; samastha – all; sAmsArika svabhAva: – the manner of dwellers of earth (samsAris); thathpAdhAmbujadhvayam – those two exalted lotus like feet; pravEkshyAmi – will attain? He is now wondering when he will get to attain the exalted feet. What type of feet are they? They are such that the desire in him to carry out kainkaryam to those two exalted feet of bhagavAn makes him to reject the desire in all the other enjoyments which are sought after by samsAris (dwellers in materialistic realm) as their nature. madhurayA girA paricharyAyAm agyApayishyathi– kadhA – when; mAm – me; bhagavAn – bhagavAn; svakIyayA – his own; athiSIthalayA – very cool (calm and gentle); dhruSa – eye; avalOkya – to look; snigdha – gentle; gambhIra – deep; madhurayA girA – mellifluous voice; paricharyAyAm – to do kainkaryam; AgyApayishyathi – will order? When will bhagavAn, with his merciful, cool eyes glance at me and in his thunderous, sweet voice order me to carry out kainkaryam to him? ithi bhagavath paricharyAyAm ASAm varthdhayithvA – ithi – like this; bhagavath – bhagavAn‘s; paricharyAyAm – to carry out kainkaryam; ASAm – desire; varthdhayithvA – to make it grow. He is praying to bhagavAn to make the desire to carry out kainkaryam to him to grow more and more. thayaiva ASayA thath prasAdha upabrumhithayA bhagavantham upEthya – thayaiva – with that; ASayA – desire; thath prasAdha – with bhagavAn‘s grace; upaburmhithayA – bring pushed; bhagavantham – bhagavAn; upEthya – near. With the desire (to carry out kainkaryam to bhagavAn) pushing him, with bhagavAn’s loving grace, he nears bhagavAn. 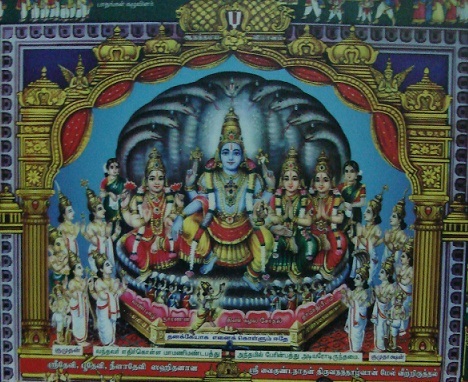 dhUrAdhEva bhagavantham SEshabhOgE SrIyA saha AsInam vainathEyAdhibhi sEvyamAnam – dhUrAdhEva – from a distance; bhagavantham – bhagavAn; SEshabhOgE – sitting on AdhiSEshan (serpent bed), SrIyA – mahAlakshmi (it is inferred that bhUdhEvi and neelAdhEvi are also there); saha – with; AsInam – sitting by the side; vainathEya – garudan; Adhibhi – and others; sEvyamAnam – worshipped by. 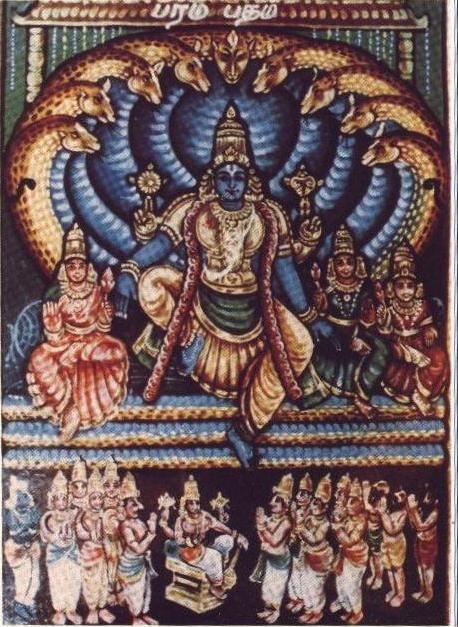 From a distance, he sees bhagavAn, sitting on the 1000 hooded serpent bed, with SrI, bhU and neelA dhEvis, surrounded by nithyasUris such as vainathEyan and others, worshipping them. samastha parivArAya SrImathE nArAyaNAya nama: ithi praNamya uththAya uththAya, puna: puna: praNamya – samastha – all; parivArAyA – surrounded by ASrithars; SrimAthE – with SrI mahAlakshmi; nArAyaNAya nama: – salutations to nArAyaNan; ithi – saying this; praNamya – prostrating; uththAya uththAya puna: puna: praNamya– standing at the place where the head touched earlier and prostrating again, standing up again at the place where the head touched earlier and prostrating again (doing this repeatedly till he reached bhagavAn). From a distance he sees bhagavAn surrounded by ASrithars. He offers salutation to bhagavAn along with his consorts and prostrates himself repeatedly till he reaches bhagavAn. athyantha sAdhvasa vinayAvanathO bhUthvA bhagavathpArishadha gaNanAyakai: dhvArapAlai: krupayA snEha garbhayA dhruSA avalOkitha: – athyantha – without an end; sAdhvasa – timidly; vinaya – with humility; avanathO – head bowed; bhUthva – being; bhagavath – bhagavAn‘s; pArishadha – attendants; gaNanAyakai: – his chieftains; dhvArapAlai: – his guards at the entrance (loosely, door-keepers); krupayA snEha garbhayA – with grace and friendliness; dhruSA – with their eyes; avalOkitha – viewed by. As he approaches bhagavAn by repeatedly prostrating in front of bhagavAn and takes a few steps with humility, head bowed, the nithyasUris near bhagavAn (his attendants, his chieftains and the guards at the entrance) look at him with grace and friendliness. samyak abhivandhithai: thairEva anumatha; bhUthvA bhagavantham upEthya SrImathA mUlamanthrENa ‘bhagavan! mAm aikAnthikAthyanthika paricharyA karaNaya parigruhNIshva;’ ithi yAchamAna: praNamya AthmAnam bhagavathE nivEdhayEth – samyak – very well; abhivandhithai: – saluted respectfully; thairEva – only with their; anumatha: bhUthva – permission; bhagavantham – bhagavAn; upEthya – nearing; SrImathA mUlamanthrENa – reciting thirumanthram; bhagavAn – hE (oh) bhagavAn! ; mAm – me; aikAnthika – with single focus; Athyanthika – till the end; paricharyA – to carry out kainkaryam; karaNaya – as an implement for kainkaryam; praigruhNIshva: – accept; ithi – like this; yAchamAna: – praying; praNamya – prostrating; AthmAnam – self; bhagavathE – to bhagavAn; nivEdhayEth – offers. The jIvAthmA now takes permission from bhagavAn’s ASrithars and reciting thirumantham, approaches bhagavAn and beseeches him to accept him as an implement for carrying out kainkaryam (could be as a lamp or as a vessel used in thiruvArAdhanam or any such implement) till the end. So saying, he prostrates himself before bhagavAn and offers himself to bhagavAn. This brings us to the end of 3rd chUrNai. We shall now move on to the 4th chUrNai. This entry was posted in gadhya thrayam, Other, SrIvaikuNta gadhyam on April 21, 2016 by T N Krishnan. athimanOhara kirIta makuta – athi – very; manOhara – captivating the heart; kirIta – the round ornament worn over the head; makuta – the long crown worn over kirItam. The head gears that bhagavAn wears are capable of capturing the hearts of those who happen to have their dharshan (view). 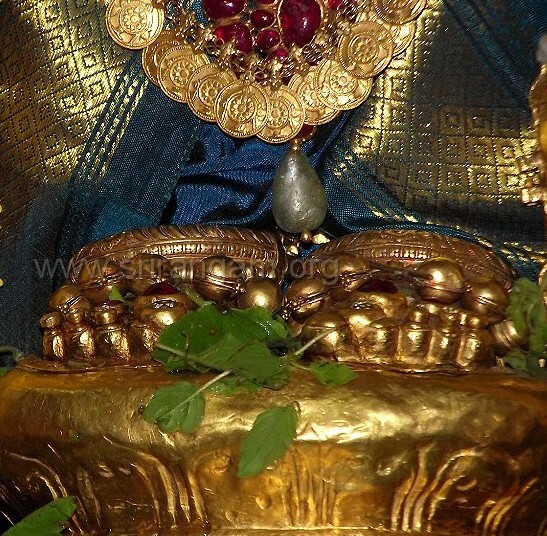 chUdA avathamsa – chUdA – a pendant worn on the head, coming upto the top of the forehead. avathamsa – worn on the top portion of the ears. makara kuNdala – makara – fish; kuNdala – ear drops. graivEyaka – ornament worn around the neck (neck-band, does not come below the neck). hAra – chains which hang upto the stomach or further below. kataka – bracelet worn on the wrist. kAnchIguNa – a golden cord worn around the waist. athyantha sukha Sparsai: – athyantha – without an end; sukha – comfortable; Sparsai – touch. With so many ornaments on his divine form, will they not cause him discomfort or irritation? No, on the other hand, they would be like touching him with flowers, so soft they would be. These ornaments are nithyasUris. Will they cause him any discomfort? dhivyagandhai – dhivya – aprAkrutha (divine); gandhai: – smell. They are ornaments only, but even they would emit a sweet fragrance. bhUshaNair bhUshitham – bhUshaNair – with such ornaments; bhUshitham – decorated. He is adorned with such divine ornaments. SrImathyA vaijayanthyA vanamAlayA virAjitham – SrImathya – beautiful; vaijayanthyA vanamAlayA – an ornamental garland made with 5 stones which is an identity for SrIman nArAyaNan similar to his conch, discus, AdhiSEshan paryankam (serpent bed) etc; virAjitham – adorned. Sanka chakra gadhASi SArngAdhi dhivyAyudhai: sEvyamAnam – Sanka – conch (pAnchajanyam); chakra – discus (sudharSan); gadhA – mace (kaumOdhaki); aSi – sword (kadgam); SArnga – bow; Adhi – various weapons like these. dhivya – divine; Ayudhai: – weapons; sEvyamAnam – worshipped by. Why should he have weapons in SrIvaikuNtam where no enemy can ever approach? It is perfectly understandable if he has these weapons in our bhUlOkam (earth) as people like rAvaNa, kumbhakarNa, SiSupAla et al keep coming. But why there? Two reasons are given – one is that they are also there as ornaments to decorate him. The other reason is that his ASrithars there (such as AzhwArs) are always worried that something terrible would happen to him even at a place such as SrIvaikuNtam. Hence to pacify them he wears these. After describing bhagavAn‘s ornaments and armaments, SrI rAmAnuja now turns to nithyasUris (those who dwell permanently in SrIvaikuNtam, carrying out endless service to bhagavAn). sankalpamAthrAvakluptha jagaj janma sthithi dhvamsAdhikE – sankalpa – will; mAthra – only; avakluptha – administered; jagaj – universe; janma – creation; sthithi – protection; dhvamsa – destruction. Possessing to a high degree the ability to create plant, animal, human species in the world merely at his will. Who is this nithyasUri? SrImathi vishvaksEnE – SrImathi – with kainkarya as wealth; vishvaksEnE – to SrI vishvaksEnar, who is the head of bhagavAn‘s army. nyastha samastha Athma aiSvaryam – nyastha – placed; samastha – all; Athma aiSvaryam – controlling all AthmAs. bhagavAn has given the role of creating, protecting and destroying all worlds to his principal nithyasUri, vishvaksEnar. vainathEyAdhibhi: – Starting with vainathEya (garuda, bhagavAn‘s vehicle), included in this list are bhagavAn’s bodyguards and chieftains. There are guards for protecting entrance to SrIvaikuNtam in each of the 4 directions. There are also armies in all directions and for each of these units there are heads (chieftains). svabhAvatha: nirastha samastha sAmsArika svabhAvai: – svabhAvatha: – as their nature; nirastha – removed; samastha – all; sAmsArika – of samsAris (those who dwell in bhUlOkam, earth); svabhAvai: – their basic traits and nature. These nithyasUris do not have any connection with the nature of jIvAthmAs who dwell in materialistic realm, samsAram. bhagavath paricharyA karaNa yOgyai: – bhagavath – bhagavAn‘s; paricharyA – kainkaryam; karaNa – to carry out; yOgyai: – have the capability. These nithyasUris have the right and capability to carry out kainkaryam to bhagavAn always. bhagavath paricharyaika bhOgai: – bhagavath – bhagavAn‘s; paricharya – kainkaryam; Eka bhOgai: – only sustenance. These nithyasUris have only kainkaryam to bhagavAn as their sustenance. nithya sidhdhai: – they are always present. ananthai: – endless – there is no count to their numbers. yathA yOgam sEvayamAnam – yatha – whatever; yOgam – kainkaryam that the nithyasUris have been blessed with; sEvyamAnam – worshipped by. bhagavAn is worshipped by these nithyasUris who are blessed with appropriate kainkaryam each day. Athma bhOgEna anusamhitha parAdhikAla dhivya amala kOmala avalOkanEna – Athma – self; bhOgEna – enjoyment; anusamhitha – protect; parAdhikAla – for ever; dhivya – divine; amala – pure; kOmala – beautiful; avalOkanEna – graceful glance. bhagavAn enjoys these kainkaryams from nithyasUris, for his own enjoyment. He looks at with divine, faultless, divine eyes. Looks at whom? viSvam AhlAdhayantham – viSvam – entire world, with all its living entities. AhlAdhayantham – making them happy and comfortable. Ishadh unmeelitha mukhAmbuja adhara vinirgathEna – Isadh – a little bit; unmeelitha – just blossomed; mukha – face; ambuja – lotus; adhara – lips; vinirgathEAna – coming out from . Starting with this, until akhilajana hrudhAyAntharAni Apurayantham, SrI rAmAnuja describes the sweetness in the words and the beautiful way that bhagavAn speaks. Here he says that his lips are parted just a little, like a just blossoming lotus, and out of these opened lips come out the sweet words. dhivya Anana aravindha SObhAjanakEna – dhivya – divine; Anana – mouth; aravindha – lotus; SObhA – splendour; janakEna – producing; His divine words have the effect of producing an effect which is like adding an ornament to his lotus-like lips. dhivya gAmbhIrya audhArya mAdhurya Adhi anavadhika guNa gaNa vibhUshithEna – dhivya – divine; gAmbhIrya – depth; audhArya – generous; mAdhurya – sweet (honey-like); Adhi – similar qualities; anavadhika – countless; guNa – qualities; gaNa – cluster of; vibhUshithEna – decorated. His divine words are decorated with qualities such as being deep (like thunderous sound), generous (giving lot of meanings to whatever he says), sweet etc which are all divine. athi manOhara dhivya bhAvagarbhENa – athi – very; manOhara – captivating the minds of listeners; dhivya – divine; bhAvagarbhENa – emotional content. His divine words are capable of captivating minds with their emotional (having lot of meanings) content. dhivya leelA AlApa amruthEna – dhivya – divine; leelA – elegance; AlApa – sweet words; amruthEna – like nectar. His divine elegant words are sweet and full of nectar. akhila jana hrudhya antharAnya apUrayantham – akhila – all; jana – living species; hrudhaya – hearts; antharAnya – inner space; apUrayantham – filled with. He fills up the inner spaces in the hearts of all living beings with his sweet words. bhagavantham nArAyaNam – bhagavantham – one who has all auspicious qualities, which are opposite of all faults; nArAyaNam – the personification of such an entitiy, SrIman nArAyaNan. dhyAna yOgEna dhrushtvA – dhyAna yOgEna – through meditation; dhrushtvA – able to see. The jIvAthmA who has got liberated and reached SrIvaikuNtam is able to have dharshan (vision) of bhagavAn through meditation. This is called as mAnasa sAkshAthkAram (ability to see through the mind). Normally, this mAnasa sAkshAthkAram is acquired by a person who reaches bhagavAn through bhakthi yOgam (devotional path), which is a very tough path to wade through. The same effect is reached by a prapannan (one who carries out prapaththi or SaraNAgathi). This is the end result of repeatedly thinking about bhagavAn every day (we had seen this in the 2nd chUrNai, prathyaham Athma ujjIvanAya Evam anusmarEth). bhagavatha: nithya swAmyam Athmana: nithya dhAsyam cha yathA avasthitham anusandhAya – bhagavatha: – bhagavAn; nithya – always; swAmyam – master; Athmana: – jIvAthmA; nithya dhAsyam – always servant; cha – and; yathA – whatever; avasthitham – situation or position. anushandhAya – to repeat. Once the true positions of the two entities (bhagavAn and jIvAthmA) are realised (that he is swAmy or owner and jIvAthmA is dhAsan or servant or owned), mind immediately starts desiring for kainkaryam. We shall now see the remaining portion of this chUrNai in part 4. This entry was posted in gadhya thrayam, Other, SrIvaikuNta gadhyam on April 18, 2016 by T N Krishnan. sarvadhA anubhUyamAnairabi apUrvavath AScharyam Avahadhbhi: – sarvadhA – always; anubhUyamAnairabi – even if experienced; apUrvavath – incomparable; AScharyam – wondrous; Even if these are experienced on a daily basis, the novelty in them is incomparable. The happiness derived out of each moment is different from the previous moment. krIdASailaSatha sahasrair alankruthai: – krIdA – for playing; Saila – mountains; Satha – hundreds; sahasrair – thousands; alankruthai: – decorated. There are hundreds and thousands of mountains for indulgence. kaiSchin nArAyaNa dhivya leelA asAdhAraNai: – kaiSchith – some; nArAyaNa dhivya leelA – for the pastime of nArAyaNa; asAdhAraNai: – special. There are some special orchards which are exclusively for the use of nArAyaNa. 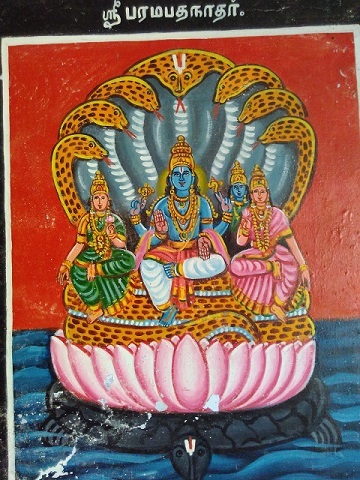 kaiSchith padhmavanAlayA dhivyaleelA asAdhAraNai: – padhmavanAlayA – one who has lotus orchards as dwelling place (SrI mahAlakshmi). Similarly there are exclusive orchards for the pastime of SrI mahAlakshmi. sAdhAraNaischa kaiSchith – There are some orchards which are common to both mahAlakshmi and nArAyaNa. Suka SArikA mayUra kOkilAdhibhi: – Suka – parrots; SArika – a sub-species of parrots; mayUra – peacocks; kOkila – cuckoo; Adhibhi: – many others such as swans etc. There are many species of birds in these orchards. kOmalakUjithai:, Akulai: – kOmala – sweet; kUjithai – cooing (making sounds); Akulai: filled with. The entire place is filled with the sweet calls and cooing of these birds. maNimukthA pravAlakrutha sOpAnai: – maNi mukthA pravAla – ruby, pearl, coral; krutha – made of; sOpAnai: – steps to tank or lake or river. Inside the gardens and orchards are tanks/lakes with steps made of gems such as ruby, pearl, coral etc. dhivyAmala amrutha rasOdhakai: – dhivya – aprAkrutha (divine); amala – without any fault; amrutha – nectar like; rasOdhakai: – taste of water body. The divine water bodies inside the orchards have the taste of faultless nectar. dhivyANdaja varai: – dhivya – divine; aNdaja – born from egg (birds); varai: – different species. Around the water bodies are trees which have many species of divine birds. athi ramaNiya dharSanai: – athi – very; ramaNIya – pleasant; dharSanai: – to see. These birds are very pleasant to look at. athi manOhara madhura svarai: Akulai: – athi – very; manOhara – enchanting; madhura – mellifluous; svarai: – voice or sound. Akulai: – filled with. Their voices are very enchanting and honey-like and the place is filled with such birds. anthastha mukthAmaya dhivya krIdAsthAna upaSObhithai: – anthastha – inside; mukthAmaya – made of pearls; dhivya – divine; krIdAsthAna – locations for playing; upaSObhithai: – adorned with. Inside the orchards are places which are made of pearls. dhivya saugandhika vApi Satha sahasrai: – dhivya – divine; saugandhika – sweet smelling (white or blue lily); vApi – lake ; Satha sahasrai: – hundreds of thousands of. There are hundreds of thousands of lakes or ponds with sweet smelling divine flowers. 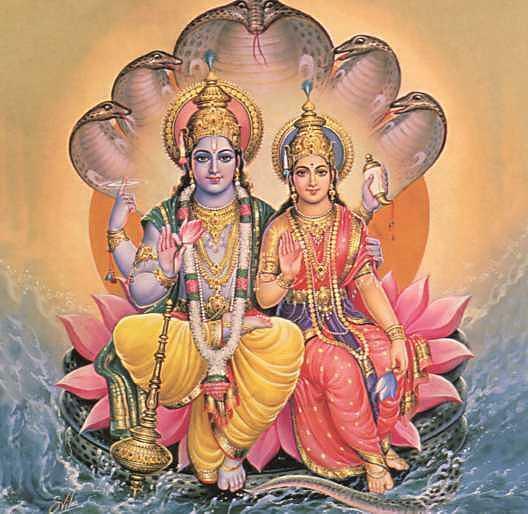 dhivya rAjahmasa Avalee virAjithai: AvruthE – dhivya – divine; rAjahamsa – royal swan; Avalee – row of; virajithai: – adorned; AvruthE – surrounded with. The ponds are beautified by the flock of sudhdha sathva, royal swans. thathra thathra krutha dhivya pushpa paryanka upaSObhithE – thathra thathra – here and there; krutha – carried out; dhivya – divine; pushpa – flower; paryanka – bed; upaSObhithE – adorned. Decorated with aprAkrutha (divine) flowery beds, here and there. nAnA pushpa Asava AsvAdha maththa brunga Avaleebhi: udhgeeyamAna dhivya gAndharvENa ApUrithE – nAnA – different types; pushpa – flowers; Asava – nectar (honey) of flowers; AsvAdha – drink; maththa – drunken (overjoyed); brunga – bee or wasp; Avalee– a collection of wasps; udhgeeyamAna – singing (humming); dhivya – divine; gAndharvENa – like divine singers; ApUrithE – filled with. Wasps drink nectar dropping from different types of flowers and in an over-joyous mood sing like gandharvas (celestial singers) and the entire place is filled with their music. madhyE pushpa sanchaya vichithrithE – madhyE – in the centre; pushpa sanchaya – cluster of loose flowers; vichithrithE – like an art work. mahathi dhivya yOga paryankE – mahathi – huge; dhivya – divine; yOga – total; paryankE – on the bed. anantha bhOgini – anantha – thivananthAzhvAn (AdhiSEshan, 1000 hooded serpent) bhOgini – serpent. Till now, SrI rAmAnuja has described various parts of SrIvaikuNtam, starting with hundreds of thousands of lakes, ponds, tanks, how these are decorated with steps made of precious stones such as ruby, sapphire, pearl, coral etc, different types of trees that surround these lakes, the types of flowers that grow on the orchards, the pillars in the garden studded with precious stones, the floor made with precious stones, the bees and wasps that drink the nectar from the flowers, the gentle breeze that wades through several sweet smelling substances, how in the midst of all these, on a serpent bed, bedecked with flowery arrangement – emperumAn, along with his consorts, is giving audience to his ASrithars, as described below. SEsha SEshASana Adhi sarva parijanam – Sesha – AdhiSEshan; SEshASana – vishvaksEnar (head of emperumAn’s army); Adhi – and many others following them; sarva – all; parijanam – servitors. prathyagra unmeelitha saraSija sadhruSa nayana ugalam – prathyagra – just then; unmeelitha – blossomed; saraSija – born in pond (lotus); sadhruSa – equivalent; nayana – eye; ugalam – two. bhagavAn‘s two divine eyes are like lotus flowers which have just blossomed. svachcha neela jImUtha sankASam – svachcha – clear; neela – bluish black; jImUtha – cloud; sankASam – appearance. His appearance is like the dark clouds. athyujjvala pIthavAsasam – athi – very; ujjvala – bright/luminous; pItha – yellow; vAsasam – clothed in. He is dressed in an extremely bright yellow vasthram (clothe). svayA prabhayA – svayam – self; prabhayA – radiant. He emits from his form, a brilliant radiance. athinirmalayA – athi -very; nirmalayA – without any dOsham (fault). He is absolutely faultless. athiSeethalayA – athi – very; SeethalayA – cold. He is very gentle and calm. mANikyAbhayA – mAnikka – ruby; bhayA – radiance. He has brilliance like ruby. kruthsnam jagath bhAsayantham – kruthsnam – without leaving out anything; jagath – world; bhAsayantham – illuminate. bhagavAn illuminates the entire world with the radiance from his physical form. achinthya dhivya adhbhutha – achinthya – beyond thoughts; dhivya – aprAkrutha (divine); adhbhutha – wonderful. His form is beyond one’s imagination, it is divine and wonderful. nithya yauvana svabhAva lAvaNyamaya amrutha sAgaram – nithya – without any time-limit (always); yauvana – youthful (he is always 16 years old, irrespective of the number of years that have passed. He is that young, always); svabhAva – as his nature; lAvaNyamaya – full of beauty, taken as a whole (as opposed to soundharyam which means beauty of specific feature such as nose or eyes or face etc), amrutha -nectar, sAgaram – ocean. SrI rAmAnuja now describes bhagavAn‘s physical features. athisaukumAryAth Ishath prasvinnavath AlakshyamANa lalAta palaka dhivya alakAvalee virAjitham – athi – very; saukumAryath – delicate (thin); Ishath – a little bit; prasvinnavath – spread out ; AlakshayamAna – visible; lalAta – forehead; palaka – flat part; dhivya – divine; alakAvalee – bundle of curled lock; virAjitham – adorned. bhagavAn‘s curled lock are soft, thin, a little spread out, and come upto the flat surface of his forehead. prabhudhdha mukthAmbhuja chArulOchanam – prabhudhdha – blossomed; muktha – fresh; ambhuja – lotus; chAru – pleasant; lOchanam – divine eyes. He is extremely happy on seeing his ASrithars due to which his eyes blossom like a lotus. Lotus is taken here as a simile. However, unlike the eyes, lotus (i) is not broad, (ii) does not secrete love and friendliness, (iii) does not blossom on seeing ASrithars, (iv) does not steal the hearts of those who come to have dharshan (vision) of it. savibhrama bhrUlatham – savibhrama – knit; bhrUlatham – arched eye-brows. His eye brows are like the curved sugar-cane bow of manmathan (most handsome person). ujjvalAdharam – ujjvala – luminous; adharam – lips. Lips are like coral and are bright. Suchismitham – Suchi – pure; smitham – smile. There is no falseness in his smile. He is genuinely happy on seeing his ASrithars and it shows in his smile. kOmala gaNdam – kOmala – pleasing; gaNdam – cheeks. His cheeks attract the ASrithars towards them with their beauty and well rounded nature. unnasam – long (prominent) nose; like kaRpaga creeper (a type of plant) which grows only in celestial worlds. udhagra pIna amsa vilambi kuNdala alakAvalee bandhura kambukandharam – udhagra – tall; pIna – large; amSa – shoulder; vilambi – hanging; kuNdala – ear-ring; alaka – curled lock; Avalee – bundle; bandhura – charming ; kambu – three lines or marks in the neck; kandharam -neck. Earlier SrI rAmAnuja had mentioned about the curly lock on his forehead. Now he describes bhagavAn‘s neck. The neck goes well with his shoulders. His curled locks hang upto the neck, which has three lines, signifying the identity of purushOththaman (highest among all AthmAs). His ear rings are also adding beauty to his neck. priyAvathamsa uthpala karNabhUshaNa – priyAvatha – beautiful; amsa – shoulder; uthpala – like a water lily; karNa – for the ears; bhUshaNa – ornament. The ornaments for the ears are coming upto the shoulder. One wonders whether they are ornaments for the ears or for the shoulder or for the locks which also fall on to the shoulder. SlathAlakAbandha vimardha Samsibhi: chathurbhI: AjAnu vilambibhi: bhujai: virAjitham – Thus the four shoulders on which the ear rings hang loosely, extend upto the knee (as an extension through the arms) and adorn emperumAn. athikOmala dhivyarEkhAlankrutha AthAmra karathalam – athikOmala – very beautiful; dhivya rekhA – divine lines; alankrutha – decorated with; AthAmra – several others starting from this; karathalam – palm. bhagavAn‘s palms are decorated with special marks such as lotus, conch (Sankam), disc (SudharSana chakram) etc. dhivyAnguleeyaka virAjitham – dhivya – divine; anguleeyaka – rings on fingers; virAjitham – adorned. His fingers are adorned with divine rings. athikOmala nakAvalee virAjitham – athikOmala – very beautiful; nakAvalee – row of nails; virAjitham – adorned with. It is said that chandran (moon) took 20 forms and presented himself as nails on the fingers and toes of bhagavAn to carry out kainkaryam. athirakthAnguleebhi: alankrutham – athi – very; raktha – reddish; anguleebhi: – fingers; alankrutham – decorated with. His divine fingers are deep reddish in colour. thathkshaNOnmileetha puNdarIka sadhruSa charaNa yugalam– thath – that; kshaNa – moment; unmeelitha – blossomed; puNdarIka – lotus; sadhruSa – equivalent; charaNa – divine feet; yugalam – two. His divine feet are like lotus that has just blossomed. Until now, SrI rAmAnuja has described various angams (physical features) of bhagavAn. Next he describes the ornaments and weapons that decorate his physical form. We shall see these and the remainder of this chUrNai in the next part. This entry was posted in gadhya thrayam, Other, SrIvaikuNta gadhyam on April 15, 2016 by T N Krishnan. This chUrNai describes the archirAdhi mArga (the path which starts with archis, light) through which a jIvAthmA, who has thus surrendered to bhagavAn and gets liberated from samsAram (materialistic realm) travels and attains SrIvaikuNtam. It also describes the many-splendoured facets of SrIvaikuNtam. This is a very lengthy chUrNai and we shall see it in several parts. chathurdhaSa bhuvanAthmakam – chathurdaSa – fourteen; bhuvanam – world; Athmakam – composed of. There are 7 worlds including bhU: (earth) (bhU;, bhuva:, suva:, maha:, jana:, thapa: sathyam) which are above, and 7 worlds starting with athala (athala, suthala, vithala, nithala, rasAthala, thalAthala, pAthala) below. What is it that these 14 worlds constitute? aNdam – These 14 worlds taken together form an egg-shaped assembly of worlds called aNdam (egg). It has an end-to-end spread of 50 crore yOjana (one yOjana is 10 miles or 16 kms in our parlance). dhaSaguNitha uththarancha AvaraNa sapthakam – dhaSa – ten; guNitha – times; uththaram – above; cha – also; AvaraNa – wrapper or cover; sapthakam – collection or aggregate of 7. Around each such egg (aNdam, that we have seen above) are 7 covers, with each succeeding cover being 10 times bigger than the previous cover. What are these 7 covers made of? They are prithvi (14 worlds in the centre), vAri (water), vahni (fire), anila (air or wind), AkASa (open or empty space), ahankAra (ego, third source of creation), mahAn (great, the 2nd source of creation) and avyaktham (prakruthi or primordial matter, primary source of creation ). samastham – all. All the above mentioned entities put together form one aNdam. SrIvishNu purANam says that there are thousands and ten thousands of such aNdam and hundreds of crores of such entities. kArya kAraNa jAtham – effect and causative factors (those that are produced by and those that produce). For example, avyaktham (prakruthi or primordial matter) that we have seen above is the causative factor for mahAn. mahAn produces ahankAram which in turn gives rise to the five elements sky, wind, fire, water and earth. Thus avyaktham is kAraNam while mahAn is both kAraNam (as it gives rise to ahankAram) and kAryam (as it came from avyaktham). athIthya – crossing. The liberated jIvAthmA crosses all these entities. The crossing is done once and he does not come back to samsAram. In bhagavadh gIthA, krishNa says that the AthmA who reaches upto sathya lOkam (brahmA‘s world) returns to samsAram. But the AthmA who has spent all his karma (both pApa and puNya, sin and virtue) crosses sathya lOkam too and does not return to samsAram. What sort of a place does such an AthmA reach? parama – superior. That which does not have anything higher than itself. vyOma SabdhAbhidhEyE – vyOma – sky or ether; Sabdha – word; abhidhEyE – expressed as. The AthmA crosses all the earlier mentioned worlds and reaches the entity that is called as parama vyOma (superior sky). Unlike karmabhUmi (earth, the place where we take a physical form in line with our karma to get rid of prArabdha karma) this place does not limit our knowledge, but clears our thoughts. Is this place limited? brahmA AdhInAm vAngmanasa agOcharE – Unlike simple people such as ourselves who have limited knowledge and power, this place is beyond the reach of highly knowledgeable people such as brahmA, Siva and other celestial beings. It is beyond their speech and thought. Does this place have a name? SrImathi vaikuNtE dhivyalOkE – it is called as SrIvaikuNtam. Unlike karmabhUmi where there are impediments while carrying our kainkaryam, this is permanent and free from any hurdle. Srimathi here refers to kainkaryam. vaikuNtE – there is no shortage for gyAna (knowledge) and Sakthi (energy or strength) here as there is no concealment of these by karmA. dhivyalOkE – not mAnushalOkam (world inhabited by human beings). Different from it. dhivya also means aprAkrutha (not prAkrutha, not composed of sathva/rajas/thamas, but only Sudhdha sathva). Having mentioned about the place, the next few words describe about the people who are in it. sanaka vidhi Sivadhibhir achinthya svabhAva aiSvaryai: – sanaka – one of the four mAnasa puthrars of brahmA (the four sons created by brahmA through his thoughts); vidhi – brahmA; Siva – rudhran; Adhibi – many other celestial entities, starting from these; achinthya – beyond their thoughts; svabhAva – as its nature; aiSvaryai: – having plenty of wealth. Even highly knowledgeable persons such as brahmA, Siva, sanaka and others can not fathom about the glory and type of persons who are inhabiting SrivaikuNtam and the wealth of SrIvaikuNtam. nithya sidhdhai: – unlike mukthAthmAs who are devoted to bhagavAn, only from the time that they reach SrIvaikuNtam after being liberated, the inhabitants of SrIvaikuNtam (nithyasUris) have been there always and have been permanently carrying out kainkaryam to bhagavAn. ananthai: – The nithyasUris are not limited in number. They are countless. bhagavath AnukUlya bhOgai: – their only purpose is to act the way bhagavAn wants them to; i.e. not acting independently. They are enjoyed by bhagavAn the way he likes and they enjoy his auspicious qualities. dhivya purushai: – divine people. aprAkrutha (composed of only sudhdha sathva, pure good) people. mahAthmabhi: – great people. Their greatness is such that bhagavAn will not tolerate if they are separated from him. ApUrithE – filled up. SrivaikuNtam is filled up with such people. It is not that only a few nithyasUris are there. thEshAmapi – even they. Their svabhAvam (nature) is such that others such as brahmA, Siva et al can not think or talk about them and their greatness or about SrIvaikuNtam. Are such nithyasUris able to give details about SrIvaikuNtam that they inhabit? ithi parichchEththum ayOgyE – even these nithyasUris do not have the ability to define these characteristics of SrIvaikuNtam. dhivya AvaraNa Satha sahasra AvruthE – dhivya – aprAkrutha (pure good); AvaraNa – cover (like a compound wall); Satha – hundreds; sahasra – thousands; AvruthE – filled with. SrIvaikuNtam has hundreds of thousands of compounds walls which, unlike what we see in leelA vinbhUthi (our materialistic realm), are made of pure good entity (sudhdha sathvam). Who has the courage to wage a war against him? Why then should there be so many compound walls in SrIvaikuNtam? The answer to this is that it is like the capital of a country. Here bhagavAn is the king of the country. Hence it should have all the qualifications of a capital. Thus there are many compound walls. Moreover the inhabitants of this country worry about the safety of their king even at places where such fear is misplaced (similar to periyAzhwAr singing pallANdu pallANdu on emperumAn) and this leads to the roles getting reversed. Thus the protector is protected (nithyasUris protect bhagavAn). To fulfill this role, compound walls have been constructed. Will the place be one of granting protection only, without anything for enjoyment? dhivya kalpakatharu upaSObhithE – dhivya – aprAkrutha (sudhdha sathva); kalpaka tharu – a tree which fulfills the wishes of those who wish for something while standing under it; upaSObhithE – adorned with. Unlike the kalpakatharu in lowly swargam (heaven, ruled by indhra) which is prAkrutha tree, the kalpakatharu in SrivaikuNtam is dhivya or aprAkrutham. The kalpakatharu in SrIvaikuNtam is not just one tree but it is a grove or garden of such trees. This is a source of enjoyment there. dhivya udhyAna Satha sahasra kOtibhi: AvruthE – dhivya – divine; udhyAna – garden; Satha – hundred; sahasra – thousand; kOtibhi: – crore; AvruthE – filled with. There are hundreds of thousands of crores of gardens in SrivaikuNtam for SrIvaikuNtanAthan (emperumAn or bhagavAn) and nAchimArs (his consorts) for spending their time in an enjoyable way. athipramANE – beyond measure. It is not possible to define its length and breadth. dhivya AyathanE – divine temple; SrivaikuNtam itself is like a divine temple whose dimensions are beyond measurement. kasmimSchith – at some place, which is beyond our thought or imagination or grasp. vichithra rathnamayE – vichithra – of many types; rathnamayE – full of gems. dhivya AshthAna maNdapE – dhivya – divine; AsthAna – assembly; maNdapa – hall. Here the reference is to the court which bhagavAn holds in SrIvaikuNtam when he gives dharshan (audience) to all nithyasUris and mukthAthmAs. dhivya rathna sthambha Satha sahasra kOtibhi: upaSObithE – the maNdapam (hall) is adorned with hundreds of thousands of pillars (sthamba)made of ruby and such gems. dhivya nAnA rathna krutha sthala vichithrithE – the sthala (floor) is made of different types of divine, wonderful rubies. dhivya alankAra alankruthE – the roof of the hall, the screen held in front of emperumAn (bhagavAn) and his pirAttis (consorts) etc have been decorated in an artful way. paritha: pathithai: – paritha – surround; pathitha – fallen. Surrounding the mandapam (bhagavAn‘s court-hall) are plants and trees from which flowers have fallen on to the ground. pathamAnai: – flowers are just dropping from the plants and trees. pAdhapasthaiScha – flowers that are also (still) on the plants and trees. Thus we have flowers that have dropped, that are dropping and that are still blooming. This may be confusing but we should understand that there is no factor called kAla (time) in SrivaikuNtam and hence all these events take place simultaneously for the enjoyment of its inhabitants and bhagavAn and his pirAttis. nAnA gandha varNai: – nAnA – different; gandha – smell; varNa – colour. These flowers are of different scents and colours. dhivya pushpa SObhamAnai: – dhivya – divine; pushpa – flowers; SObhamAna – adorned with. The hall is adorned with various types of flowers having different smells (scents) and different hues of colours. dhivya pushpa upavanai: upaSObhithE – the place is adorned with such orchards and gardens. sankIrNa pArijAtha Adhi kalpadhruma upaSObhithai: – sankIrNa – mixed. Adorned with trees such as pArijAtham (a type of tree that gives rise to sweet smelling flower (night-flowering coral jasmine)), sandalwood, harichandanam (type of sandal tree) mixed with kalpaka trees. asankIrNaiScha kaiSchith – also adorned with stand-alone trees (trees that are not mixed with other types). anthastha pushpa rathna Adhi nirmitha dhivya leelA maNdapa Satha sahaasra upaSObhiththai: – inside the groves, there are different types of maNdapams (halls) such as pushpa maNdapa (flower hall), rathna maNdapa (ruby hall) and which are present in hundreds of thousands of numbers for the divine play of bhagavAn and his consorts. We shall continue from where we left in the next part of this chUrNai. This entry was posted in gadhya thrayam, Other, SrIvaikuNta gadhyam on April 13, 2016 by T N Krishnan. Is it that we have to surrender once to bhagavAn and then forget about it? For getting the benefit (whether it is attaining mOksham (SrIvaikuNtam) or carrying out kainkaryam to pirAtti and bhagavAn), it is enough to do surrender once. However, since we continue to live in this samsAram (materialistic realm), we need to remind ourselves that we have surrendered to bhagavAn as the fear of samsAram will continue until we leave it. thathaScha – dhvaya upanishadh says thadhdhvayam sakruthuchchArO bhavathi (this is dvayam; it is said once). SrI rAma in his charama SlOkam (ultimate SlOkam) says sakrudhEva prapannAya (surrendering only once). It is enough if it is recited once as upAyam (the path for reaching bhagavAn). But it demands to be repeated many times over. What is the limit for this? prathyaham – prathi – every; ahas – day. It has to be recited every day. Is repeating this every day being done because of any inadequacy in fulfilment of our effort? Athma ujjIvanAya – SarIra jIvanam – living in this world for the sake of physical body. Athma jIvanam – living in this world, doing only good things and not indulging in anything not mentioned in SAsthras. Athma ujjIvanam – leaving this world and attaining SrivaikuNtam. For this, AthmA has to constantly keep thinking of bhagavAn. In gAruda purANam, it says that if in a muhUrtham (equivalent of 48 minutes) a person does not think of vAsudhEvan (SrIman nArAyaNan) even for a moment, it will entail terrible harm, great danger, utter confusion. In effect, it means total emaciation of the soul. Can this repetition be done with less effort? Evam – thus. It should be recited with the same dedication and belief with which it was recited the first time when the person carried out SaraNAgathi (surrendering). anusmarEth (prathyaham) – We have seen that we should recite this every day. Is it enough if we recite once every day? anusmarEth – keep remembering through the day. Keep remembering without any break as we had seen in SaraNAgathi gadhyam (dhvayam artha anusandhAnena saha sadhA Evam vakthA – keep repeating dhvayam knowing its meaning, all the time). It is to be remembered all 365 days, until we leave this world. Hence, in order to stick to the path of righteousness and to remind ourselves that we are living in this dreadful samsAram, we have to keep reciting and thinking about SaraNAgathi all the time, every day. We shall now move on to the 3rd chUrNai. This entry was posted in gadhya thrayam, Other, SrIvaikuNta gadhyam on April 11, 2016 by T N Krishnan. Continuing from the previous part, we shall now see how bhagavadh SrI rAmAnuja describes what upAyam (the “means” for reaching bhagavAn) is (starting from thasyaiva and ending with charaNAravindha yugalam) and how In the third and last part how he surrenders (starting from ananyAthma sanjIvanEna and ending with anuvrajEth). thasyaiva bhagavathO nArAyaNasya – thasyaiva – as said; bhagavathO – bhagavAn; nArAyaNasya – that nArAyaNan. Earlier (in part 2 of this chUrNai), we had seen the terms bhagavantham nArAyanAm. There, we had seen the qualities of bhagavAn which were needed for him to be prApyam (be the fruit of surrendering) as well as the holder of these qualities. Here, the qualities for him to be prApakam (as means for attaining bhagavAn) and the holder of these qualities are described. akhilasathva dhayaika sAgarasya – ocean of mercy for all. akhilasathva – considering all living beings, without any distinction. dhayA – not able to bear the sufferings of others, without expecting anything for self. EkasAgarasya – the waters of dhayA form an ocean and take refuge only under bhagavAn, and under no one else. Is it that he (bhagavAn) wishes to confirm that others suffer and then feels sad for them? In other words, does he look at the extent of suffering of others? No…. anAlOchitha guNa aguNa akhaNda jana anukUla amaryAdha Seelavatha: – he has a quality, sauSeelya, by which he does not consider the virtues or faults of others. This quality is unlimited and is shown to all people without any distinction. anAlOchitha – not examining whether granting refuge to a person (who wishes to surrender) is advantageous or not. guNa aguNa – Describes qualities which are desired and not desired among ASrithars – the qualities can be ignorant or knowledgeable; believer or atheist; righteous or unjust; humble or immodest. akhaNda jana – he does not make a distinction among celestial persons, human beings, animals, plants etc when they approach him as an ASrithar. Here the word jana does not denote people as we commonly understand but any one who has a jani (birth) viz. anyone who is living. anukUla – he guides the ASrithar to go by the correct path and not take difficult paths. amaryAdha – here maryAdhA means limit. He does not show any limit when showing his magnanimity to his ASrithars. dhEva thiryak manushya Adhi akhila jana hrudhaya Anandhanasya – Without any distinction between the wise and the unwise entities, everyone’s heart will melt out of happiness. What is the basis for such an act? There is a special reason and it is …. svAbhAvika anavadhika athiSaya guNavaththayA – possessing wondrous quality as his nature, without any boundary. SrI rAmAnuja has described already so many qualities of bhagavAn, right from the beginning. What is this new quality that he is now mentioning? The qualities mentioned all along have been qualities of his AthmA (bhagavAn’s soul). The quality that is being mentioned here is that of his thirumEni (physical form). His AthmA guNas may or may not attract others, but the beauty of his physical form is bound to attract everyone. His radiance and delicate gentleness are the qualities that attract others to him. His beauty attracted even a demonic woman such as sUrpaNakA. Same goes true for vanadhEvathAs (angels in the forest) who were attracted to rAma when he entered forest. His beauty appealed not only to the eyes but also to the hearts of both his devotees and his enemies. But then, does he not give any special status to his ASrithars (followers)? Or does he remain same to everyone? ASritha vAthsalyaika jaladhE: – He has the quality of vAthsalyam (treating faults as virtues) towards his ASrithars like an ocean. Who is called as an ASrithar? Is it a person like vashisht or nammAzhwAr? In SrI rAmAyaNam, the rishis (sages) tell SrI rAmA when he enters forest that he is their king whether he is in ayOdhyA or in forest, and they are his citizens and hence he has to protect them. Important to note here is that they are not merely living in the country where he is king, but they accept that he is the ruler and they are citizens. In a similar way, it is not enough if we live in a dhivya dhEsam but we need to accept the he is the bhagavAn and he has to protect us. Then we can be called his ASrithars. Also, anyone who has performed SaraNAgathi once to him and pirAtti (his consort) is an ASrithar. Included in this category is any person who offers something to him with bhakthi (devotion) – a leaf, flower, fruit or water. The leaf need not be thuLasi (basil plant) but even a dried leaf picked up from the street corner, offered with devotion, is enough, says bhagavAn in bhagavadh gIthai. vAthsalya is the quality exhibited by a cow that removes all the dirt from the body of its calf at the time when the calf is born. It does not clean the dirt if the calf comes dirty after 10 or 15 days. In the same way, bhagavAn removes all our past sins on the day when we carry out SaraNAgathi. But if we commit pApa (sinful act) even after performing SaraNAgathi and go to him for forgiving us, he is not going to oblige. Is there any proof that he forgives the sins when we go to him for taking refuge? Again, in SrI rAmAyaNam, when vibhIshNa comes to thiruppullANi shore, SrI rAma says that if a person comes to him with a friendly mind, he will accept him and not let him down, even if the person comes with faults. Eka jaladhE: – bhagavAn is the only shelter to such ASrithars. Is it that he only gives to his ASrithars? Isn’t there anything in it for him? bhakthajana samSlEshaika bhOgasya – bhakthajana – those who are his devotees, who are friendly towards him; samSlEsham – to be together; Eka – only; bhOgasya – fit for enjoyment. bhakthajana – bhakthi is carrying out service with affection (friendliness). bhakthajana is anyone who does this. samSlEshaika bhOgasya – He enjoys being together with such bakthajana. He can not withstand separation from them even for a moment. Just as nammAzhwAr considered thirukkOLUr perumAn as his dhAraka, pOshaka, bhOgyam (that which is essential for life, for growth and for enjoyment respectively), for bhagavAN, his ASrithar becomes his dhAraka, pOshaka and bhOgyam. nithya gyAna kriya aiSvaryAdhi bhOga sAmagrI samrudhdhasya – sAmagri – implements. In order to enjoy anything, one should have gyNa, kriyA and aiSvaryam as implements. gyAna is knowledge about the bhOga vasthu (that which is to be enjoyed), its svarUpa, rUpa, guNa, chEshtA (activity), prayOjana kAla (when it should be enjoyed). kriyA is the actual act of enjoying the bhOga vasthu. aiSvarya – wealth (owning the bhOga vasthu). sAmagrI is the combination of gyAna, kriya, aiSvarya. samrudhdhasya – this enjoyment is not something finite or small but huge or plenty. Even if bhOga vasthu and bhOga sAmagrI are available, wouldn’t one need a bhOgasthAnam (place to enjoy) in order to enjoy the bhOga vasthu? mahAvibhUthE: – maha – huge; vibhUthE – wealth. Here this refers to his SrIvaikuNtam which is three times as large as the entire cosmos (thousands and thousands of aNda katAkam (galaxy)). In order to enjoy the bhOga vasthus, he has a location which is endless and full of happiness. In such a place where he is going to enjoy the materials (vasthu), does he enjoy singly, like a brahmachAri (bachelor)? charaNAravindha yugalam – two lotus-like feet. His exalted feet are our natural goal to attain, source of wondrous enjoyment and they take in everyone who approaches them. Why should we hold on to them? ananyAthma sanjIvanEna – ananya – without substitute; Athma – soul; sanjIvanEna – total sustenance. There is no other path available for the sustenance of jIvAthmA. thath gatha sarva bhAvEna – thath – that; gatha – reach; sarva – all; bhAvEna – manner. Holding on the two exalted feet in all manner (that they will protect, that they will provide enjoyment, that they will purify us etc). What is to be done with these thoughts? SaraNam anuvrajEth – SaraNam – to surrender; anuvrajEth – to hold on firmly. jIvAthmA has to hold on to his exalted feet as the path to reach him, with firmness in mind. It should also be done with the thought that his feet are to be held firmly, all the time. This brings us to the end of 1st chUrNai. Let us move on to the 2nd. This entry was posted in gadhya thrayam, Other, SrIvaikuNta gadhyam on April 8, 2016 by T N Krishnan. We have seen how the auspicious qualities of bhagavAn come as waves from a great ocean, in the previous part. We shall continue from there. paramapurusham bhagavantham nArAyaNam – He is nArAyaNan. What sort of an entity is he? He is..
paramapurusham – superior entity. The word “purusha” is common to both jIvAthmA and ISvaran. In order to point out to the correct entity, the adjective “parama” has been added to purusha. “parO mA asmAdhithi parama:” – there is no one superior to him, hence he is paramapurushan. Is there any name for this most wondrous entity? nArAyaNam – He is nArAyaNan, who has no one superior to him, as mentioned in vEdham (nArAyaNAdhbrahmA jAyathE (brahmA was born out of nArAyaNa), nArAyaNAdhrudhrO jAyAthE (rudhra was born out of nArAyaNa)). nArAyaNa is responsible for the creation of brahmA, rudhra et al. He is paramapurushan, bhagavAn, possessing the 6 primary auspicious qualities (gyAna, bhala, aiSvarya, vIrya, Sakthi, thEja:). Usage of the two terms nArAyaNam and paramapurusham is from purusha sUktham. The term bhagavAn has been taken from rahasya AmnAyam which says that pavithram vAsudhEvO bhagavAn, sankarshaNO bhagavAn, pradhyumnO bhagavAn, anirudhdhO bhagavAn, implying the 6 most auspicious qualities of bhagavAn (sankarshaNan, pradhyumnan and anirudhdhan are forms of vyUha vAsudhEva (bhagavAn in thiruppARkadal or kshIrAbdhinAthan). Of them, sankarshaNan is the God for destruction, pradhyumnan for creation and anirudhdhan for protection and each of these three Gods takes 2 qualities from the 6 mentioned earlier; sankarshaNan has as major qualities gyAna and bala, pradhyumnan has aisvarya and vIrya while anirudhdhan has Sakthi and thEjas). Taken together, all these would conclusively affirm that the vEdhams refer only to nArAyaNan in the beginning, middle and end. Until now the superiority of the entity that we attain (on surrendering) has been described. From here, the prayer that SrI rAmAnuja offers for carrying kainkaryam (service to bhagavAn) is described. swAmithvEna guruthvEna suhruthvEna cha parigruhya – the larger meanings of the word nArAyaNa are explained in these terms. There are four main qualities associated with the entity nArAyaNa – swAmithva (owner or master), saulabhya (easy to access), sauseelya (not seeing any difference between self and ASrithars (followers) and moving in a friendly manner with them) and vAthsalya (treating faults as virtues in ASrithars). swAmithvEna directly refers to his quality of swAmithvam (he is the Lord). guruthvEna refers to his quality of saulabhya as he came down from SrIvaikuNtam to become the first AchAryan (guru or teacher). saulabhyam is associated with teacher as teacher comes down to the level of student to explain difficult terms. suhruthvEna refers to sauseelyam as suhruth means a person with a good heart (feels for the difficulties of others) and sauseelyam as a quality means being friendly with people without looking at the difference in levels (level could be one of wealth or intellect or practices). The fourth quality vAthsalya is referred to in the term “cha” in the above mentioned verse. There is another interpretation given by vyAkhyAthA (commentator) periyavAchchAn piLLai. Initially there were three terms, paramapurusham, bhagavantham, nArAyaNam. Now there are three terms, swAmithvEna, guruthvEna, suhruthvEna. He now compares each of the terms in the first set with each of the terms in the seconod set, in the same order. Thus paramapurusham is compared with swAmithvEna, bhagavantham with guruthvEna and nArAyaNam with suhruthvEna. In purusha sUktham (one of five sUkthams which were mentioned in vEdhams to glorify SrIman nArAyaNa and his consorts, SrI, bhU and neeLAdhEvi), the term purusham denotes bhagavAn being a swAmy; thus there is correlation between the terms paramapurusham and svAmithvEna. In the treatise rahasya AmnAyam, sankarshaNa is referred to as sankarshaNO bhagavAn (please see the term nArAyaNam above where this has been explained in detail). Since sankarshaNan possesses gyAna as prime quality, it is tantamount to saying that he is guru as only guru teaches gyAna. Since sankarshaNan is called bhagavAn, we can infer that there is direct correlation between bhagavAn and guru and hence we can see that guruthvEna is the equivalent of bhagavantham. In nArAyaNa anuvAkam (nArAyaNa sUktham), it is said “anthar bahiScha thath sarvam vyApya nArAyaNa: sthitha:” which means that nArAyaNan pervades both inside and outside throughout. Thus he is antharyAmi (one who resides inside). Since he resides inside the heart (hrudhaya), he is suhruth. And since he is nArAyaNan, we can say that nArAyaNan is suhruth. Thus we establish correlation between nArAyaNam and suhruthvEna. The vyAkhyAthA gives a third interpretation to bring out the equivalents between the two sets of terms. We are discussing SaraNAgathi (surrendering). swAmithvEna brings the context of sva-swAmy relationship (sva means property, the possession and swAmy means Lord, the possessor). guruthvEna brings out the Sishya-AchArya (student-teacher) relationship. suhruthvEna refers to friendly relationship as in SaraNam suhruth gathir nArAyaNa: (from subAlOpanishadh). Hence suhruthvEna corresponds well to nArAyaNam. Thus we have seen correlation among the two sets of terms, paramapurusham, bhagavantham, nArAyaNam and swAmithvEna, guruthvEna, suhruthvEna. parigruhya – to hold on firmly. Instead of only one person (bhagavadh SrI rAmAnuja) holding on to him, here the reference is to all the people living in samsAram (materialistic realm) who are holding firmly onto him. Another interpretation is – holding on to him in all ways (as mentioned in SAsthrAs, as tutored by AchAryas and as practiced by bhagavAn himself). Once he thought about the swAmithvam of bhagavan, SrI rAmAnuja thinks about the kainkaryam to be performed to bhagavAn which is the quality of a servitor. aikAnthika Athyanthika thath pAdhAmbhuja dhvaya paricharyaika manOratha: – aikAnthika – with single focus; Athyanthika – without end; thath – that; pAdha – exalted feet; ambhuja – lotus like; dhvaya – two of them; paricharyA – to carry out kainkaryam; Eka – only; manOratha – desire of mind. aikAnthika – EkAntha sambhandhi (only bhagavAn and servitor; no one else). This word can join with ‘thath‘ or with ‘thath pAdhAmbhujadhvaya” or with ‘paricharyai‘. When it joins with ‘thath‘ (that bhagavAn), i.e. thath aikAnthika, it refers to the close relationship with bhagavAn, without any cause or reason. If it is taken together with ‘thath pAdhAmbhujadhvaya‘, i.e. thath pAdhAmbhujadhvaya aikAnthika, it refers to the deep love that the servitor has towards the exalted feet of the master and this is said to be in keeping with the svarUpam of the servitor. thath pAdhAmbhujadhvaya – kainkaryam always means carrying out service to bhagavAn‘s two exalted feet. His feet secrete honey just like the secretion of a lotus flower. ambhuja (lotus) is brought in as a simile to indicate that the enjoyment for the servitor will be sweet and desirous. dhvaya refers to two feet which are the path (means) for reaching bhagavAn. Also, as purushArtham (fruit of attaining bhagavAn) it refers to perumAL (bhagavAn) and pirAtti (his consort) together for whom the kainkaryam is carried out. paricharyA – charyA – history or carrying out or kainkaryam. Here the meaning to be considered is kainkaryam. paricharyA – all types of kainkaryam. Another meaning for paricharyA is to keep circling (whether to have dharSan of bhagavAn or circum-ambulating the garbhagruham (sanctum sanctorum) of bhagavAn) repeatedly to do kainkaryam. EkamanOratha: – leaving out all the other prayOjanam (benefits of attaining bhagavAn), focusing only on carrying out kainkaryam to bhagavAn, with devotion and determination. thath prApthayE – to attain that manOratham (desire of mind) of doing kainkaryam. cha – also. Is there anything else to be attained and along with that, attain kainkaryam too? Why is he mentioning ‘cha‘ here which would indicate that there is more than one prApyam (fruit of surrendering)? The vyAkyAthA comes up with a very beautiful explanation here: What is the meaning of “thath pAdha” in the words “thath pAdhAmbhujadhvaya paricharyaika manOratha:“? It is nothing but ASrithar (follower). This is because it is the ASrithar who is bhagavAn‘s exalted feet. Hence SrI rAmAnuja is praying for doing kainkaryam not only to bhagavAn but also to his ASrithar or bhAgavathar. This is brought out by thiruppANAzhwAr‘s first pAsuram “adiyArkku ennai Atpaduththa vimalan” (the faultless bhagavAn engaged me in carrying out kainkaryam to his ASrithars). Another interpretation given for “cha” is that bhagavadh SrI rAmAnuja is not only having the desire for carrying out kainkaryam but he also wants to carry out that kainkaryam. Thus it is one thing to have desire for kainkaryam and the other thing is to carry out that kainkaryam. Hence the word “cha” has been added. Up to now, he has described upEya svarUpam (the true nature of carrying out kainkaryam to bhagavAn). Now he describes the upAya nishkarsham (the certainty of the path to reach bhagavAn) and its anushtAna prakAram (the method of carrying out SaraNAgathi). He divides this into three parts. Starting with thath pAdhAmbhujadhvaya prapaththE: and ending with manvAna: he ascertains the path to reach bhagavAn. Then, starting from thasya and ending with charaNAravindha he describes how the path (upAyam) will be. Finally, starting with ananyAthma and ending with anuvarajEth he describes how he surrendered. thath pAdhambhujadhvaya prapaththE: – thath – that; pAdha – foot; ambhuja – lotus like; dhvaya – two of them; prapaththE: – hold on to firmly or surrender. Earlier we had seen these same terms in thath pAdhAmbhujadhvaya paricharyaika manOratha: wherein he had described how the two exalted lotus-like feet were readily available for carrying out kainkaryam (this is called as upEyam or prApyam – the fruit of surrendering). Here he says that he is holding on to the two feet as upAyam (path to reach bhagavAn). This is also referred to by another term, prApakam. Thus we see that prApyam is also prApakam (both being attained through the two exalted feet of bhagavAn). This is also confirmed in dhvaya mahAmanthram where, in the first line, we hold on to SrIman nArAyaNan‘s two feet for reaching him (upAyam or prApakam) and in the second line, we carry out kainkaryam to SrIman nArAyaNan (to his feet) which is upEyam or prApyam. anyanna mE kalpakOti sahasrENApi sAdhanam asthi ithi manvAna: – anyath – other; na – not; mE – to me; kalpakOti sahasrENApi – for very long time; sAdhanam – means (path); asthi – available; ithi – like this; manvAna: – in thought. Roughly translated this means that: “As far as my thoughts go, there is no means available for reaching bhagavAn, other than his exalted feet, even if one were to search for such means for thousands of crores of kapla” (one kalpa is a period in brahmA’s life time, which is equivalent of 1000 times 43,72,000 years of our time). anyath – other (means for attaining bhagavAn). The “means” other than prapaththi (surrender). Included in this list are bhakthi, gyAna, karma etc which are mentioned in SAsthram. If mentioned in SAsthram, wouldn’t these qualify to be means for attaining bhagavAn? na mE asthi – not available for me. These may be adopted as means by those who have the will power to practice them – rishis, yOgis et al may adopt these means. SrI rAmAnuja says that he has been born in this samsAram for thousands of times and he is agyan (ignorant), aSakthan (without any ability. 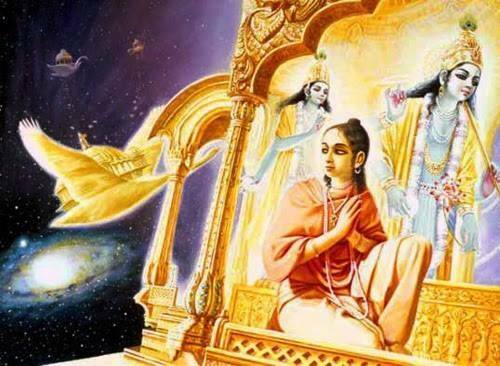 It is true that in all these births, he had been unable to attain bhagavAn, but in this birth or in the coming births, he would surely find the means for attaining bhagavAn…. kalpakOti sahasrENApi – Would a cobweb, immersed in water for thousands of days, ever germinate? In the same way, even if he were to take thousands of crores of births, he would never be able to find the means other than this, for reaching bhagavAn, says SrI rAmAnuja. sAdhanam nAsthi – there is no other means that he could fathom out. Even if he were to carry out bhakthi at some point of time, the benefit of that would go only towards wiping out some of the sins that he had committed in earlier births and not for reaching bhagavAn. ithi manvAna: – This is affirmed -that it is not possible to find another means to reach bhagavAn (other than prapaththi or SaraNAgathi) even if he were to go around looking for such means for thousands and thousands of years. We shall see the remaining portion of this chUrNai in the next part. This entry was posted in gadhya thrayam, Other, SrIvaikuNta gadhyam on March 31, 2016 by T N Krishnan. Starting with svAdhIna thrividha chEthana and ending with nArAyaNam, this chUrNai describes the superiority of bhagavAn over the svarUpam (basic nature) of chEthana (sentient) and achEthana (insentient) entities and his qualities aligned to his svarUpam. svAdhIna – Unlike chEthana and achEthana entities who are dependent on bhagavAn and are controlled by him, bhagavAn is completely independent and is under his own control and nobody else’s. 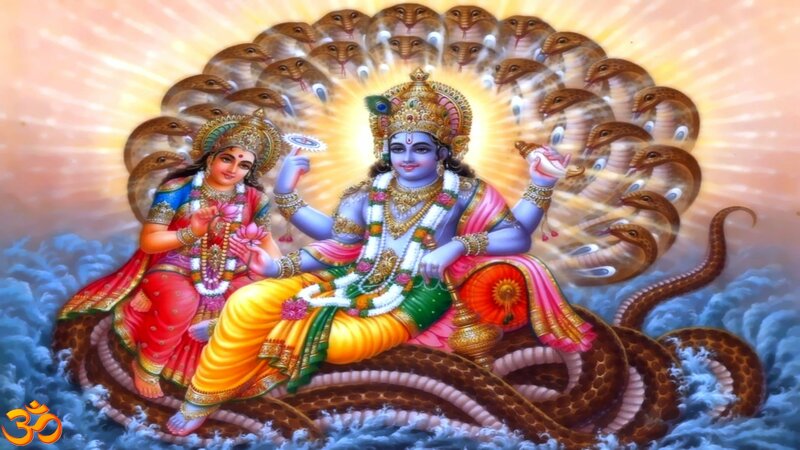 As mentioned in the palaSruthi (hymns listing the benefits) of vishNu sahasranAmam (1000 names of vishNu), jagadhvaSE varthathEdham krishNasya sacharAcharam – all the entities in the universe, apart from himself, are under the control of krishNa. thrividha chEthanAchEthana – three types of AthmAs, namely bhadhdha (those who are still bound to samsAram (materialistic realm)), muktha (those who were in samsAram earlier but who have now been liberated and are in SrIvaikuNtam) and nithya (those who have had no connection with samsAram and who have always been in SrIvaikuNtam). These are the three types of chEthana entities. The three types of achEthana entities are: prAkrutha, aprAkrutha and kAla rUpa. prAkrutha entities are those which are composed of achith (insentient) entities which exist in prakruthi (materialistic realm); aprAkrutha entities are those achith entities which exist in SrIvaikuNtam (such as lakes, tanks, steps leading to these water bodies, gardens etc). prAkrutha entities are composed of mixed saththvam (sudhdha sathvam, rAjasam and thAmasam). aprAkrutha entities are composed of sudhdha saththvam only (pure good). kAla rUpam is time dimension. svarUpa sthithi pravruththi bhEdham – the bhEdham (difference) in their svarUpa (basic nature), sthithi (life or sustenance) and pravruththi (their activities). SrI periyavAchchAn piLLai introduces three terms here to explain these three terms: dharmi svarUpam (basic nature of the entity), dharma svabhAvam (qualities of the entity) and vyApAram (activities of the entity). Thus bhagavAn has under his control, the svarUpam, svabhAvam (qualities) and vyApAram (activities) of the six chEthana and achEthana entities. We shall now look at the bhEdham (difference) in svarUpam, svabhAvam and vyAparam of these entities. For chEthana entities, the difference in their svarUpam is caused by difference in levels of happiness and sadness that they possess. Difference in their svabhAvam is due to difference in the level of their knowledge, ability to carry out tasks (doing physical kainkaryam to bhagavAn is a measure of this), their level of enjoyment (one may eat once in a day while another may eat 4 times a day), longevity (number of years that the AthmAs live in each birth) etc. Difference in pravruththi (activity) is on account of difference in knowledge, desire and effort taken in attaining an objective. For achEthana entities, difference in svarUpam is due to various manifestations such as prakruthi (primordial matter), mahAn (the great state), ahankAram (individualisation), thanmAthra (subtle elements) etc. When it comes to kAlam (time), the difference in svarUpam is on account of various measures of time such as kalA, kAshtA, muhUrtham etc (these were the units used by our forefathers centuries ago and are still in use in vaidhIka time measurements; today we have seconds, minutes, hours, day, week etc). Difference in svabhAvam for achEthana entities is their being lifeless, constantly changing nature, being permanent (an achEthana entity will change its form from one to another, but it can not be destroyed; it exists in some form or another – for example a tree can exist as a tree, as a furniture, as a stick, as charcoal etc, but it still exists), always existing for the sake of others (like a fruit or sandalwood paste etc), being composed of sAthvic, rAjasic and thAmasic entities. Difference in pravruththi (activity) is its being the initiator for various actions (for example the body which an AthmA takes when it is born in samsAram, due to which the AthmA carries out various activities, thus earning pApa or puNya), being the raw material for fabrication of various articles (wood being used to make various types of furniture, door, window etc; gold being used to make different types of jewels; cotton being used to make different types of cloth), its ability to hide bhagavAn’s svarUpam (just as dust hides the radiance of a gem when it covers the gem, the body of jIvAthmA hides his as well as bhagavAn’s true nature since it is composed of saththvam, rajas and thamas), its non-radiant nature (it cannot emit any radiance on its own and when someone looks at it, the person will not get any knowledge). One may ask, is it only bhagavAn who controls these chEthana and achEthana entities? Even the king of a country or the head of a family (in a limited way) has control over chEthana and achEthana entities. Then what is the difference between bhagavAn and others? klESa karmAdhyaSEsha dhOshAsamsprushtam – A king or head of a family is affected by faults in him (faults such as klESam, karmam etc) whereas bhagavAn is not affected by faults such as these. There is a pAthanjala sUthram which says “klESa karma vipAkASayair aparAmsrushta: purushaviSEsha ISwara”. klESa is defined as “rAgadhvEsha abhinivESA: klESa:“. rAga – desire; dhvEsha – hatred; abhinivESa – greed. These are called as klESa (suffering). There are two other faults which are clubbed to these three – avidhya (ignorance) and asmitha (ego) to form pancha klESa: (five sufferings). bhagavAn is not affected by this klEsa. karma is defined as activities resulting from and resulting in puNya (good deed or virtue) and pApa (bad deed or sin). karma does not touch bhagavAn. vipAka is the resultant of one’s jAthi (species which they belong to), Ayush (life expectancy) and bhOga (enjoyment or experience). These will be different for different AthmAs. bhagavAn is not affected by vipAka. ASaya is vAsanA (impressions left in the mind due to repeated births, which induce certain actions in the jIvAthmA). This is also not applicable to bhagavAn. Thus bhagavAn is not afflicted with any fault. Is he just the opposite of all faults? No, he is also the repository of all auspicious qualities. svAbhAvika – natural to bhagavAn. He did not get these auspicious qualities by doing any penance or as a gift from any celestial (demi) god or for any limited period of time. These qualities are present in bhagavAn as a part of his nature. Are these qualities limited in their measure? anavadhika athiSaya– without any limit. Nobody knows the limit of his qualities – not even he nor his consorts know the limit of his auspicious qualities. periyavAchchAn piLLai cites certain references here such as yathO vAchO nivarthanthE aprApya manasA saha (not possible to state either by words or by thoughts), uyarvaRa uyarnalam udayavan evan avan (his greatness is so high that the greatness of those that we know in this word would appear infinitesimal when compared to bhagavAn – thiruvAimozhi 1.1.1) to prove that there is no limit to his qualities. What are these qualities? mahArNavam – gyAna – bhagavAn’s ability to see right in front of his eyes all the events that (a) have occurred, (b) are occurring and (c) will occur, at all places. bala – ability to bear entire universe on a small part of his body. aiSvarya – ability to control all chEthana and achEthana entities and direct their activities. vIrya – when he carries the universe on himself, he does not show any distortion in his features or does not sweat. Sakthi – ability to protect all entities with no one to oppose him or cause any hurdle in his path. thEja: – his radiance is such that his opponents will shiver, just by hearing his name. Also, thEja: denotes his ability to carry out any activity without any effort. prabhruthi – starting from this. While there are many qualities, the above-mentioned six are the primary qualities. If there are many others, is there any count for these qualities, just as we say ashtOththara (108) or sahasranAma (1000)? asankhyEya – countless. If a person were granted the lifetime of brahmA and also the thousands of tongues that AdhiSEsha has, he can not complete one in 10000 of his auspicious qualities. kalyANa – auspicious. He has only auspicious qualities and does not have any faults in him. Neither his auspicious qualities nor his faults can be counted. Since there are innumerable auspicious qualities, they can not be counted. Since he does not have even one fault, this also can not counted. guNa – type of qualities is such that when one hears them, (s)he will not have to close (her) his ears. On hearing the qualities, one’s heart will melt. We have seen that his qualities are countless. Can these qualities be grouped and counted? gaNa – bundles. His qualities are innumerable and even if they are bundled into different groups, they can not be counted. Here, SrI periyavAchchAn piLLai lists a few of these bundles to describe his qualities. First in this list is his swAmithvam (qualities which will confirm that he is the swAmy or master or owner). To be called a swAmy, he needs to have qualities such as Souryam (ability to create panic among opponents even if the opponent’s army is huge), vIryam (ability to annihilate opponents without any effort), parAkramam (making even the opponents believe that he is their leader), chAthuryam (smartness/cleverness), sthairyam (standing like a rock in the face of difficulties), dhairyam (not intimidated by opponents) and so on. Next in the list is soulabhyam (simple; easy to access); following qualities are necessary to be a saulabhyan: bhavyathai (submissive), krupai (merciful), aparAdhasahathvam (putting up with faults), klESasahishNuvathvam (putting up with sufferings when it comes to self and not putting up with sufferings of ASrithars (followers)), vAthsalyam (treating faults of ASrithars as virtues), prathyupakAra nairapEkshyam (not expecting anything good in return) and so on. The third bundle of qualities in the list is souseelyam (moving easily with ASrithars, unmindful of differences between self and ASrithars), for which the following qualities are a must: sva vaibhava gyAnam (knowing well about his position/status), parakIya hEyAgyAnam (knowledge about the faults of others), akrithrimathvam (being honest; synergy among thought, speech and action) and so on. The fourth group of qualities comes under the category of vAthsalyam (treating faults in ASrithars as virtues) with following qualities: pakshapAtham (showing bias towards ASrithars), upakAranairapEkshyam (not expecting anything in return) and so on. The 5th bundle of qualities comes under the term santhOsham (happiness) with qualities such as priya, mOdha, pramOdha, Anandha (these are different levels of happiness). Thus, there is no limit to the qualities that bhagavAn possesses. Are these qualities shown one at a time? Ogha – wave. These qualities come like waves continuously and not one at a time. Where are these waves? mahArNavam – great ocean. His qualities are like a great ocean and the qualities come towards his ASrithars like waves from the ocean. We shall see more of this chUrNai in the next part. This entry was posted in gadhya thrayam, Other, SrIvaikuNta gadhyam on March 27, 2016 by T N Krishnan.